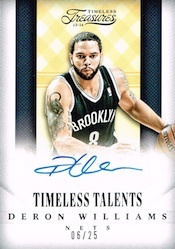 Not long after the start of the NBA season, 2013-14 Panini Timeless Treasures Basketball will offer collectors the first autographs memorabilia rookie cards of the year. Boxes of this single-pack product include two autographs and one memorabilia card. 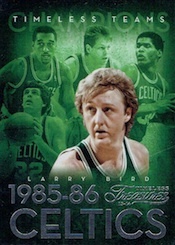 2013-14 Panini Timeless Treasures Basketball will again include base cards. These will fall one per box. 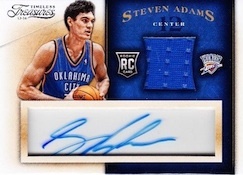 In this hit-centered product, rookie autographs are a favorite option. Autographed Memorabilia Rookie Cards will feature acetate-trapped autographs and a jersey piece. These rookie card will be numbered to 499 and there are also Prime (#/49) and Tag (1/1) parallels. 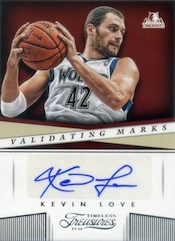 One of several autograph sets, Treasured Ink highlights the top players in the NBA. 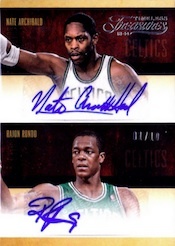 Dual Player Autographs is a new addition and includes Gold and Black parallels. Trophies Autographed Memorabilia is another new inclusion. 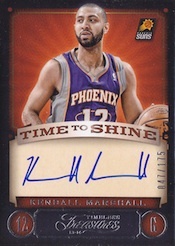 Not only about autographs, memorabilia cards are prominently featured in 2013-14 Panini Timeless Treasures Basketball. 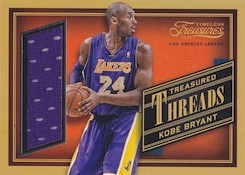 Treasured Threads is back and includes Prime and Super Prime (1/1) parallels. Every Player Every Game is another memorabilia option. Several inserts complete the product. 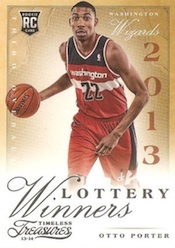 Lottery Winners honor the top 14 selections from the 2013 NBA Draft. 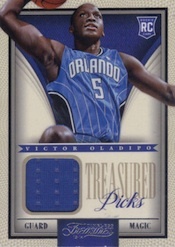 Gold parallels are numbered to the player's draft spot. Lastly, Three-Piece Puzzles add an interactive chase element. 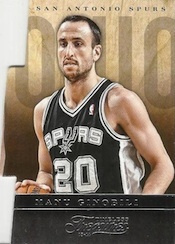 Good: Strong designs, big upgrade for rookie cards over last year, an overall classy product. Bad: More serial-numbered cards would help value, pricey. 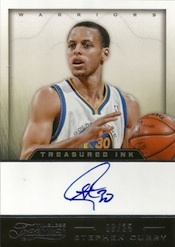 The Bottom Line: For an early-season release, 2013-14 Panini Timeless Treasures Basketball has some of the nicest cards of the year. But are they worth it? A hefty price tag combined with a decent but not spectacular checklist make for a release that collectors may want to be patient on or go the singles route. 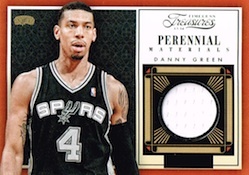 2013-14 Panini Timeless Treasures Basketball is one of those sets that looks great but in a way that doesn’t draw a lot of attention to itself. Bigger on clean lines than gimmicks, there is an elegance about the cards. Even when different printing techniques or technologies are used, they’re somewhat muted. Case in point, look at the Rookie Autographed Memorabilia cards. Last year, they had stickers and acetate, not a lice combination. Not to mention they were strictly autograph cards without any memorabilia. Gone are the stickers so the signatures are done directly on the clear surface. The result is a balanced design that stands out with the acetate, but the signing surface doesn’t command all of the card’s attention. Another thing that I like about the design is that foil is used as an accent. It’s classy and adds to the rest of the design. 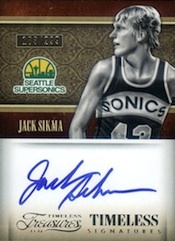 Given the price tag, more on-card signatures would be nice, especially when it comes to retired players. But this is something that can be said about a lot of products today. This is one of those products where building a set is near impossible. Most are likely going to be busting it looking for a top player or someone from their favorite team. While there are lots of big stars, there are also plenty of lesser stars and rookies. At this price tag, there should be less filler. 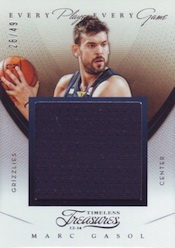 It’s hard to justify the $100-ish price tag 2013-14 Panini Timeless Treasures Basketball started out at. 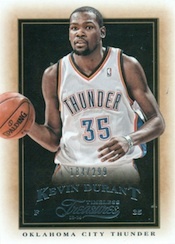 There aren’t a lot of cards, building a set is near impossible, a good chunk of the checklist doesn’t carry much clout. More numbered cards would help, but the imbalance between stars and lesser players at this price point is the bigger issue. It all adds up to something where the secondary market route looks mighty enticing. Without taking the high cost into account, this is a fun product. The cards look great, using nice techniques without going over the top. But at what price? Because it seems so aimed at the chase for the single card, it’s risky. 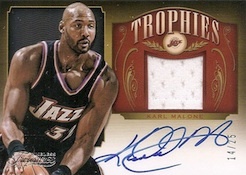 Malone. On that alone I’ll give it a 3.8.
that have not been done before or rarely. Cards are simple and clean. Overall they are good quality. 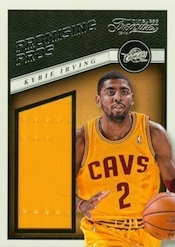 Unfortunately the redemptions are awful unless you hit an A or B level NBA star. Please save me the agony of redeeming cards that are not numbered and are virtually worthless. Thank You.